It cannot be denied that PlayerUnknown’s Battlegrounds is the PC gaming story of 2017. Like the most skilful of PUBG players, it prowled the long grass of anonymity and surged to the top of the Steam concurrent players chart in a daring smash-and-grab. It has amassed a 20-million-strong player base of duos, four-player squads, and soloists – with several imitators, to boot. It might look a little rough around the edges, but PUBG’s real beauty lies in its simplicity. Whether you know the concept from The Hunger Games, noughties Japanese cinema, or a humble game of hide-and-seek in the school playground, everyone knows what to do as soon as you are dropped from the plane: be the last player standing. Ben M gives Rainbow Six Siege his personal game of the year gong. There is always a circle, a black hole sucking everybody inexorably in. There is always gear to scavenge. There is always a chicken dinner, the carrot at the end of that tantalising stick. The rest, as they say, is up to you. PUBG is a game that gives you little guidance, dropping you into its bleak, gargantuan maps, leaving you to survive in any way you can. This simple premise holds together what is a surprisingly deep military sim of the ilk some of its players might usually ignore. Whatever strategy you adopt, a standard match demands that you make dozens of risk/reward choices, all of existential importance. It is 30 minutes of insidious stress and paranoia. You could go in all-guns blazing, risking death and the attention of nearby enemies, more often than not being downed as soon as you are spotted. But you could also stagger out of the wreckage with the most potent weapons, armed to the teeth, ready for the final showdown. Another method links back to hide-and-seek. 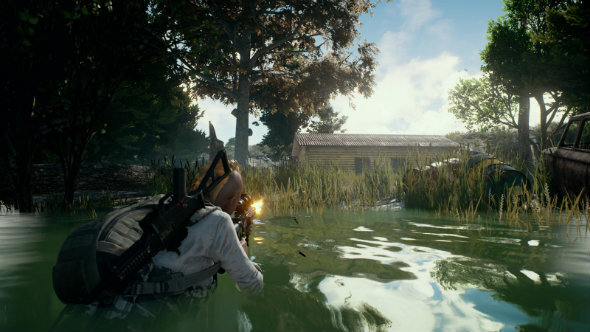 For many, PlayerUnknown’s Battlegrounds is a ‘hiding simulator’: evade detection and you could, conceivably, triumph against the 99 other players with just one kill, cackling maniacally as you let the plebs squabble over scraps before taking what is rightfully yours. That said, when it gets to the business end of a match, the superior weapons acquired by your more trigger-happy rivals will give them the edge. In this sense, PUBG turns the etiquette of multiplayer shooters on its head: camping is a legitimate strategy, which means death is usually waiting, hungrily, just out of sight in any field, corridor, or tower. The sit-and-wait method is how I, along with plenty of other battle royale veterans, choose to play. 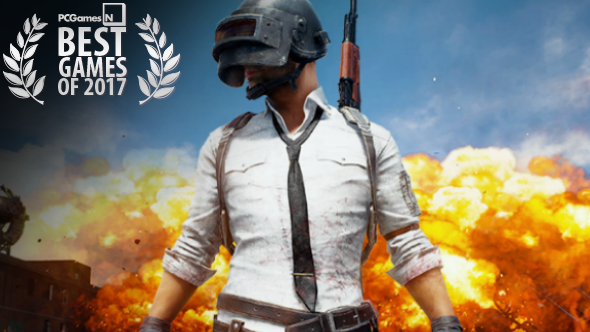 PUBG is my 2017 game of the year because it allows me to play a multiplayer shooter however I want – solo, sans screaming prepubescents, and without being forced to exert my combat prowess, or lack thereof.